"Why Isn't Pluto a Planet Anymore?" For more than twenty years, Dr. Fred Bortz worked as a scientist, researcher, and teacher. Now he spends most of his time writing books and articles for young readers like you. He enjoys both science and writing for the same reason: HE LOVES QUESTIONS. He writes for people your age because he knows you love questions, too. To find hot-links to other "Ask Dr. Fred" questions and learn how to send Dr. Fred your favorite question, go to the main "Ask Dr. Fred" page. You have reached the most popular page at Dr. Fred's Place. It's almost as popular with teachers and students as the planet Pluto, even if it has been "demoted" to "dwarf planet" status. Dr. Fred's school and community presentations are always a hit, too. 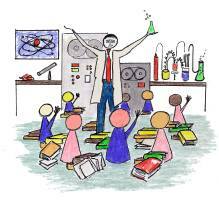 Click here to learn about how to bring Dr. Fred to your school or community. This column is copyrighted material. If you plan to use it in the classroom or for other educational or commercial purpose, please click here. August 24, 2006, was a significant day in the history of planetary science. If you read the newspaper headlines, you might think it was famous as the day that Pluto was thrown out of the planetary family. But if you read more about the 2006 meeting of the International Astronomical Union, you will discover that the story is a bit different than that. August 24, 2006, was really the first day that there was an official scientific definition of the word "planet." 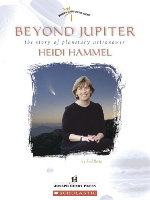 Until that date, scientists used the word planet, and many people called themselves planetary scientists (including Heidi Hammel, whose life story can be found here). But no major scientific organization had come up with an official definition. For a long time, they didn't have to, because everyone seemed to agree on what bodies should be included in the list of planets. But then, the more observations people made of Pluto, the less certain they were about including it in the list. They discovered it was smaller than they thought at first, even smaller than Mercury. They knew its path around the Sun was more elongated than the other planets, so elongated that it is closer to the Sun than Neptune for about 20 years of its 248-year orbital period. They knew that Pluto's orbit was unlike the other planets' and the asteroids, which lie in nearly the same plane as Earth's path. From Mercury to Neptune those bodies never leave a thin disk-shaped region around the Sun, but Pluto's orbit takes it well above and below that disk. When Clyde Tombaugh discovered Pluto in 1930, he and everyone else called it the ninth planet. But by the time Tombaugh died in 1997, some astronomers were expressing doubts about it. They realized that it was probably one of many large icy bodies in a distant region of the Solar System called the Kuiper (KI-per) Belt. They even suspected that it might not even be the largest Kuiper Belt object, just the first and largest one found up to that time. That made Pluto's status as a planet the kind of question that most scientists love to disagree and argue about. When scientists argue, it doesn't mean they're angry with each other. It just means they look at the same evidence and draw different conclusions. Dr. Fred thinks arguments like that are fun, especially when someone disagrees with something that no one has questioned for years, such as the number of planets in the Solar System. When a large Kuiper Belt Object known as Quaoar (kwa-oh-wahr) was discovered in 2002, people started to talk about changing Pluto's status. That's when Dr. Fred decided to include this question in his "Ask Dr. Fred" pages. He kept adding updates as new large bodies were discovered in the outer Solar System, but on day Pluto was "demoted," he knew the old article had to be rewritten completely. Before 2006, if someone asked you to list the planets in the Solar System, you would have answered with this list, going from nearest the Sun to furthest away: Mercury, Venus, Earth, Mars, Jupiter, Saturn, Uranus, Neptune, and Pluto. Those nine, no more, no less, forever and ever. The same nine planets that people have known about for centuries, right? The ancients knew only five planets, Mercury, Venus, Mars, Jupiter, and Saturn. For thousands of years, people thought that Earth was the center of everything. It wasn't until the early 1500s that some people, like the famous Polish astronomer Nicolas Copernicus, began to argue about that. Earth was a planet, he claimed, just like the other five, each following its own path -- or orbit -- around the Sun. The argument continued for more than a hundred years before most people realized Copernicus was right. The list of planets then numbered six and stayed that way until 1781, when William Herschel discovered Uranus. Uranus was so far from the Sun that it moved very slowly across the constellations; still its motion was fast enough for Herschel to notice after observing it on different nights. Once Uranus was known to be a planet, people measured its movements very carefully. By the 1840s, astronomers realized that its path was different from what the law of gravity predicted. Something was tugging it away from the predicted orbit. Could there be another planet? Yes, and the race was on to find it. In 1846, the noted French astronomer Urbain Jean-Joseph Le Verrier published an article predicting the size and orbit of the unseen planet, and on September 23 of that year, observers at the telescope of the Berlin Observatory found it. Le Verrier wanted the planet named after himself, but it became known as Neptune. Were there more planets to be found? Astronomers tracking the motion of Neptune discovered some irregularities, but for many years, observers found nothing to cause them. Finally in 1930, Clyde Tombaugh of the Lowell Obsevatory in Flagstaff, Arizona found planet number nine and named it Pluto. Pluto turned out to be unusual in many ways. The other outer planets are "gas giants" (Jupiter and Saturn) or slushy "ice giants" (Uranus and Neptune). Pluto is a tiny, solid, icy world in a more elongated orbit than the nearly circular paths of the other planets. By the late 1900s, astronomers had found that it was the smallest planet of all, even smaller than Mercury; yet it had a sizeable moon, Charon. Another oddity about Pluto is the inclination of its orbit. All the other planets follow paths in a narrow band within the boundaries of the constellations we call the zodiac, but Pluto's orbit takes it well above and below that band. Still, despite those peculiarities, no one questioned whether Pluto deserved to be called a planet. Then, in 1992, astronomers began finding smaller Pluto-like bodies in the distant reaches of the Solar System called the Kuiper (KI-per) Belt. In 2002, when nearly 100 Kuiper Belt Objects (KBOs) were already known, astronomers found a particularly large one, about half the size of Pluto, that they named Quaoar (kwa-oh-wahr) after a creation god of the Native American Tongva tribe. Its discovery was especially big news since it orbits the sun once in 288 years and has a more planet-like orbit than Pluto-Charon (more circular and less inclined). As early as 1998, some members of the International Astronomical Union (IAU) began to raise the question whether Pluto should be officially considered a planet or merely the largest known KBO at that time. In 2004, another new discovery made that question even more urgent. Scientists who study the way planetary systems formed have been speaking for years about a region far beyond the Kuiper Belt where many comets are born. Called the Oort Cloud, it is full of icy bodies that orbit the sun at about thirty times the distance of Pluto. In November 2003, astronomers observed a large icy body far beyond Pluto. By March 2004, they recognized that it was the first known Oort Cloud object. They named it Sedna for the Inuit goddess of the ocean, and reported a number of details about it and its orbit. They were able to spot Sedna because it is now nearing its closest point in a very elongated 10,500-year path around the Sun. It is currently 13 billion kilometers (about 8.5 billion miles) from the Sun, or ten times closer than the main body of the Oort Cloud. Its discoverers suspect that its original round and distant orbit was disturbed into a narrow ellipse by the gravity of a passing star early in the history of the Solar System. It will get closer and brighter for the next seventy-two years, but it will still remain much farther away than the Kuiper Belt. Then it will head back outwards toward the main Oort Cloud. The last time it approached this close to Earth, our planet was just coming out of the last ice age and most of North America was covered by glaciers. 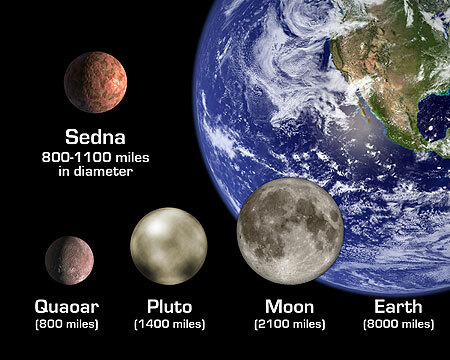 This NASA artist's conception compares the size of Earth, the Moon, Pluto, Quaoar, and Sedna. Sedna is nearly as red as Mars, but too far away and dim for scientists to determine what is is made of (besides ice). Because it is nearing its closest point to the Sun, Sedna is experiencing a warm spell. Its temperature is probably a balmy 240 degrees below zero Celsius (400 degrees below zero Fahrenheit). At its most distant point, it will be many degrees colder. The best estimate of its size is 1700 kilometers (1000 miles), halfway between Pluto and Quaoar. That's large enough for the NASA news release to call it a "planet-like body." On July 29, 2005, Dr. Mike Brown of the California Institute of Technology announced that he and fellow astronomers Chad Trujillo (of the Gemini Observatory in Hawaii) and David Rabinowitz (of Yale University) had found a world bigger than Pluto. On October 31, 2003, they first photographed it using the Samuel Oschin Telescope at Palomar Observatory near San Diego. But it is so far from the Sun that it moves very slowly across the sky. (Its orbital period is 560 years.) The astronomers only detected that motion when they took a second look at their images in January, 2005. By early 2006, they had determined that it is approximately 3000 kilometers (nearly 1900 miles) in diameter, or almost as large as Earth's Moon. The object, now known as Eris after the Greek goddess of chaos and strife, was temporarily named 2003 UB313. Its discoverers nicknamed it "Xena" after the warrior princess of a popular television program, and that name stuck until the IAU approved its official name in September 2006. This image, published in Nature, compares the size of the Eris to other large Solar System bodies from the asteroid Ceres to the four largest moons: Neptune's Triton, Earth's Moon, Saturn's Titan, and Jupiter's Ganymede. The orbit of this new Kuiper Belt Object is elongated and tilted like Pluto's, and for part of that orbit it will be closer to the Sun than Pluto. That won't happen for another 240 years, and who knows how many bigger objects will be discovered by then! Knowing that, the members of the IAU had a difficult decision. Before approving the new body's name, they had a much more important issue to settle, namely whether "Xena" should be considered a planet and what that meant for Pluto. They considered and rejected a definition that would have included not only Pluto and "Xena," but also the largest asteroid Ceres and Pluto's moon Charon. Finally, they decided that a planet should be large enough that its gravity would clear out its region in space. That demoted Pluto to the status of "dwarf planet," a category that it shares with the renamed Eris, Ceres, and other objects yet to be discovered. They decided that objects like Pluto and Eris belong in a special category of Kuiper Belt objects that has yet to be named. So the first official AIU list of the Sun's planets includes these eight worlds: Mercury, Venus, Mars, Jupiter, Saturn, Uranus, and Neptune. Does that mean that Pluto and Eris are less important or interesting? Not at all! They've just been reclassified, but that doesn't really change anything in the Universe. Pluto-Charon, Eris, Quaoar, the KBOs, Sedna, and other Oort Cloud objects are out there, and we have lots to learn by studying them. No matter what we call them, they have all certainly made names for themselves in the history of astronomy. Read more about 2003 UB313 and follow links to a blink movie showing its motion at the Sky & Telescope web site. Note added June 11, 2008: Today the AIU officially added a new category of solar system objects called Plutoids that orbit beyond Neptune and are large enough that their own gravity pulls them into a nearly spherical shape. So far, Pluto and Eris are the only bodies that qualify as Plutoids, but astronomers expect to discover many more. Dr. Fred Bortz has written about discoveries that changed the way people thought about many things in To the Young Scientist: Reflections on Doing and Living Science. Travel to the Big Island of Hawaii with Dr. Fred as he spent three days with Heidi Hammel observing Uranus, Neptune, and the moons of Mars. Click here for more "Ask Dr. Fred" questions.